From 2004 -2010 I lettered a book for Viz Media called Whistle! The story and art were by Daisuke Higuchi. I lettered pretty much the whole run and in doing so became a big fan of Higuchi as a storyteller. The following is a brief bio that ran in the series’ final issue. Daisuke Higuchi’s manga career began in 1992 when the artist was honored with third prize in the 43rd Osamu Tezuka Award. In that same year, Higuchi deputed as creator of a romantic action story titled Itaru. In 1998, Weekly Shonen Jump began serializing Whistle! 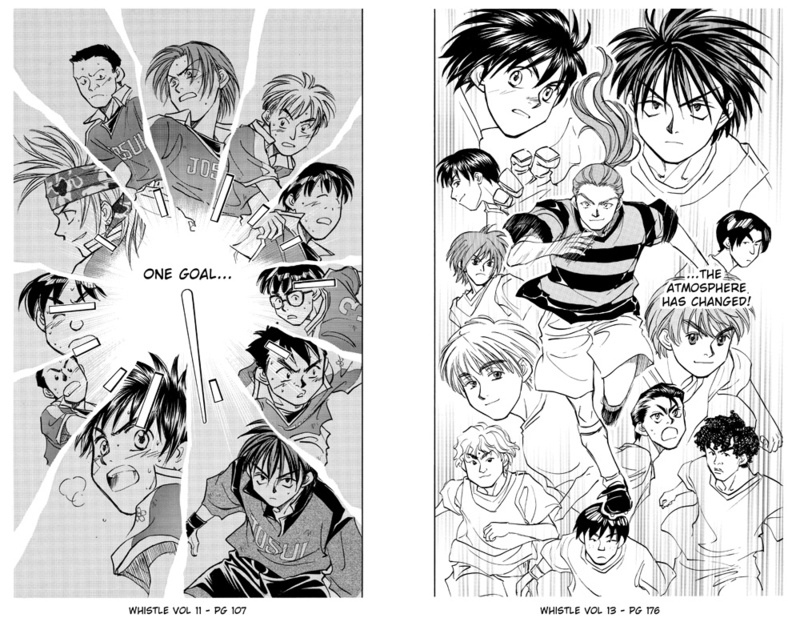 Higuchi’s realistic soccer manga became an instant hit with readers and eventually inspired an anime series, debuting on Japanese TV in May of 2002. In a nutshell, Whistle! 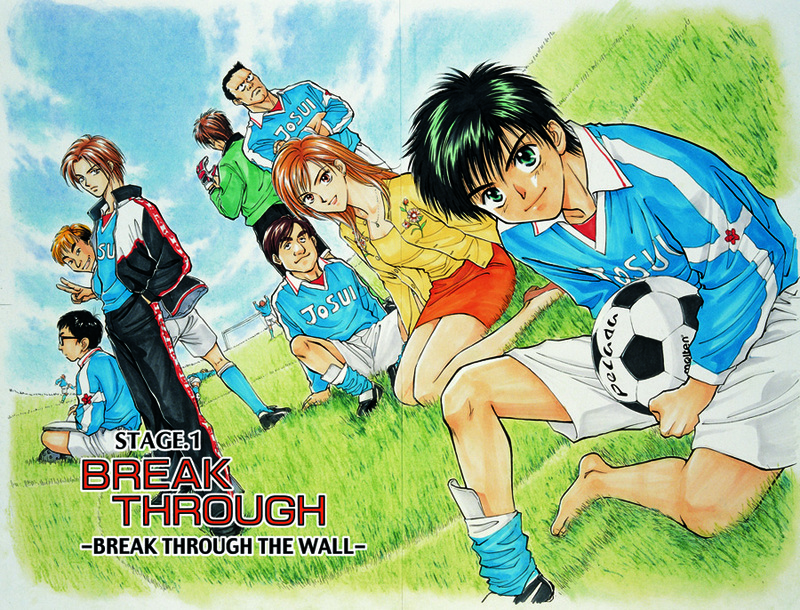 is about a young middle school boy named Shō Kazamatsuri who’s one and only dream is to play soccer but because of his small stature he has to overcome adversity after adversity to do so – he also serves as an inspiration to to his friends and teammates, drawing them closer together – classic underdog story. Whistle cast with Shō in the foreground. 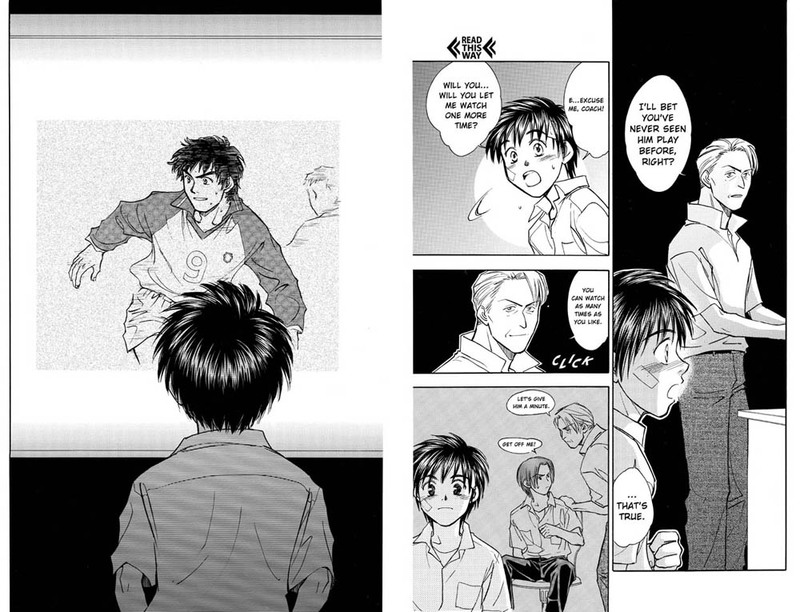 Note: For the uninitiated, the accompanying pages are read right to left – not left to right.. Page that starts out each volume if you open it the wrong way. The following pages show a great sense of design as Daisuke Higuchi freezes a moment and shows different aspects of a scene. In the scene on the left, the opposing team has just made the winning goal. 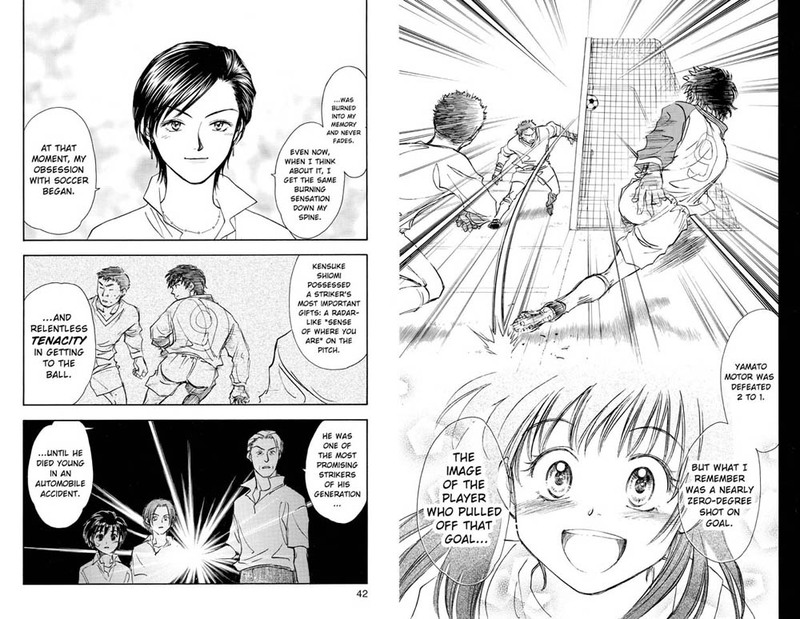 In the scene on the right, Shō’s teammate Hiroyoshi has accidentally made a goal for the opposing team. The following is from a particularly strong sequence from Volume 12. The scene that follows opens with Shō and his friend Tatsuya showing up at Tatsuya’s father’s house (who he is estranged with). 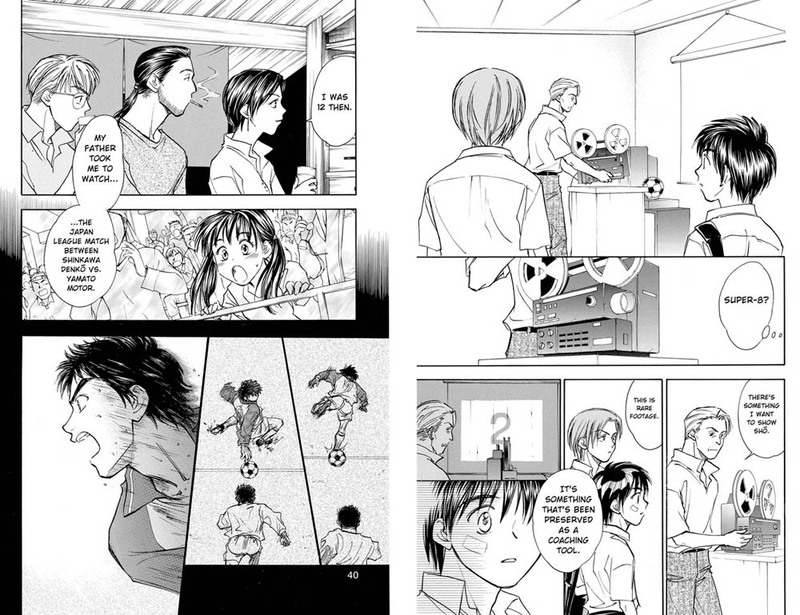 Tatsuya’s father is a soccer coach for a rival team and has some old soccer footage he wants Shō to see – at the same time some other coaches are meeting for lunch, and Akira (the female coach) echos Tatsuya’s father’s sentiments. There’s so much to love in that scene. • The way the dialogue bounces back and forth between the two characters speaking. • The look of sheer joy on Akira’s face as a young girl followed by the more reflective aspects as an adult. • The projector on the bottom of page 42 seen as just a glowing light. • The end shot of Shō as he stares entranced at the footage of a father he never knew. There are a million underdog stories out there, the ones that resonate come not from the story construct but from how deeply you’re invested in the characters. 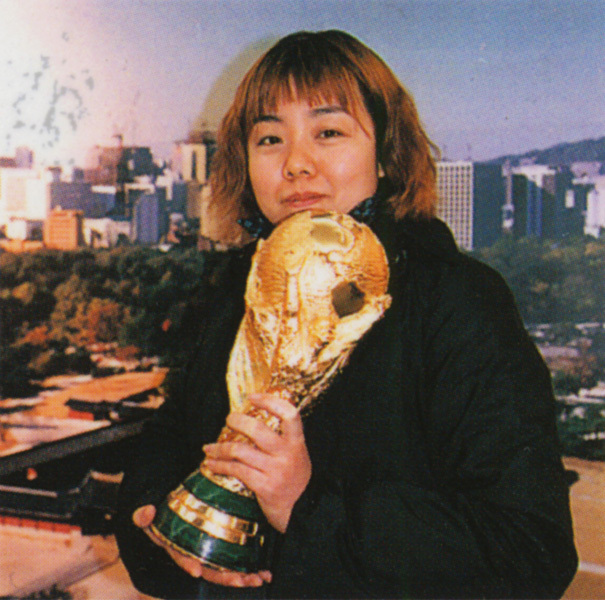 Higuchi’s strength as a storyteller is her engaging cast of characters. You can check out Whistle! at your local library’s manga section. To purchase, go to Viz.com or Amazon (to name a few). Whistle! © 1998 by Daisuke Higuchi. All rights reserved. This entry was posted in Artist Spotlight, Artists - Cartoonists, Daisuke Higuchi and tagged Daisuke Higuchi, Whistle!. Bookmark the permalink. 4 Responses to Daisuke Higuchi – Whistle! I’m amazed that I’ve stumbled upon you, somebody who actually worked on the English version of Whistle! 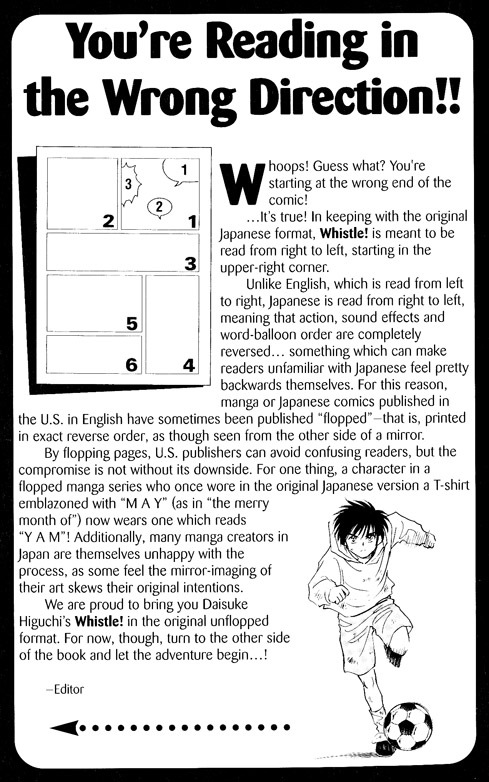 I wholly agree with your sentiments on the work of Higuchi-sensei; I can honestly say that Whistle! improved my life. I read the series between the ages of 12-14, and I was just starting to play ice hockey – and I was horrible! 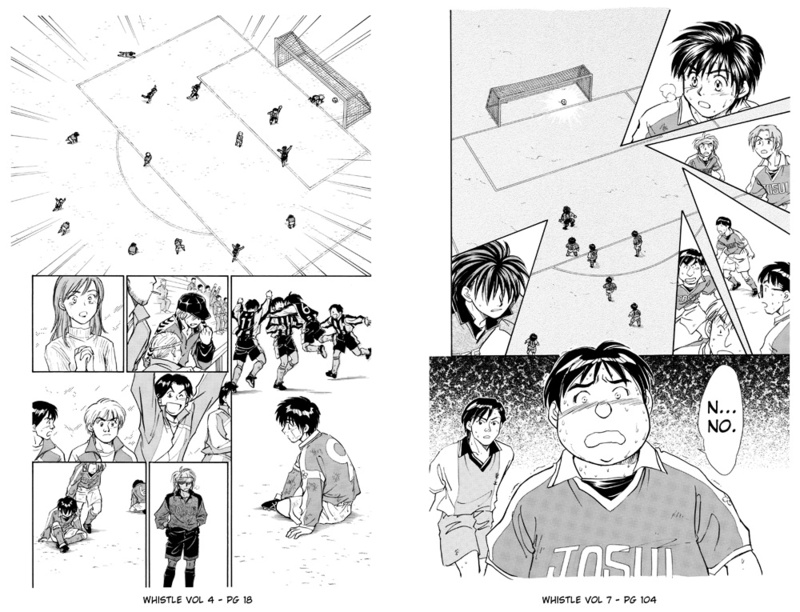 (Higuchi-sensei also wrote a manga about ice hockey, Go Ahead…how perfect is that?!) 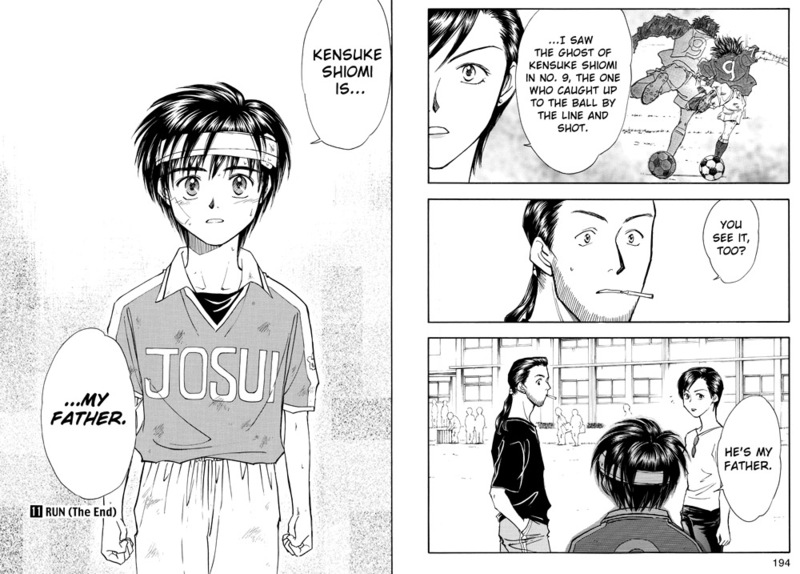 But even though a lot of my teammates were mean to me because I always messed up, Sho’s determination was actually what inspired me to keep trying during my games. It’s corny, but true. I love Whistle’s story, artwork, and the characters. That Stephen King quote is perfect. My favorite character is Daichi. He’s so introspective and…transcendental! And he’s a little weird too. I love it when he talks about wanting to dissect Sho. And his reason for playing soccer- “To know why he’s smiling.” Ah. There’s so much I love about this story that words can’t even describe it. Thanks for taking the time to write such a heartfelt response. And I don’t think it’s corny that Shō inspired you to persevere. Daisuke Higuchi really created a strong character – he gets under your skin. He definitely does. All the characters are strong, which is an impressive feat considering there are so many of them. Thank you for saying that it’s not corny!